This is the commercial law blog (or 'blawg') of Andrew Downie of the Victorian Bar. 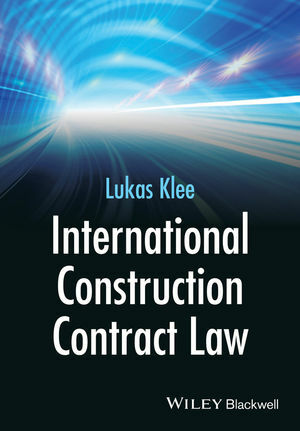 The posts include updates, case-notes, topics of interest, legal affairs and practice management. I was reading a terrific post by Mark McKillop called 'A tale of a brief in 29 parts – tips for junior lawyers briefing counsel in the email age. Mark's post discusses what to put in a brief to counsel and why. He focuses on the provision of a hardcopy brief and perhaps an email to counsel, in urgent circumstances, of the key documents in the brief. I have experienced the horror of a brief emailed in 29 or so separate parts and it almost always results in loss of time and increased expense for the client, and it occasionally results in overlooked or omitted documents. That is, it should be avoided. I agree with the comments Mark makes in his post; however, I am of the view that a properly organised electronic brief can be a lot more effective than a hardcopy brief, and can be delivered and updated a lot quicker. So how is it done? Here's my step-by-step guide. What equipment and software do you need? In order to make life easier with electronic briefs from chambers or the office to the court room you need 6 things: a computer, a scanner, an iPad (or a like tablet device), Goodreader (iPad app, or an equivalent tablet PDF annotating app), Adobe Acrobat (PDF computer program) and a cloud based storage service, like Dropbox. Most of these (apart from a cloud service and Goodreader) are expensive. However they are cheap in the long run when you consider the time, paper and cost saved. instead of delivering large numbers of folders to multiple people, all you do is email the folders containing the files, or better yet send a link to the cloud service you are storing the brief in. Let's start with the computer, the scanner and Adobe Acrobat, as this is the file creation process. First, ensure all of the documents relevant to the brief are PDF [portable document format] files, apart from any drafts that you want counsel to settle (which should be in Microsoft Word format - .doc/.docx). Ensuring all files are in PDF can be done by saving Microsoft Word format documents (.doc/.docx) as PDF files (a function that Microsoft word supports with Adobe Acrobat), or (in most cases) by scanning all of the original documents in the instructor's possession using a scanner. It is often best to scan each individual document as a separate PDF file, although this isn't a golden rule since cumbersome files, such as affidavits and contracts, can be bookmarked (see further below). Because a computer sorts files by name (and therefore number) by default, a reverse date order will always be sorted chronologically; and chronological order is the key to ordering documents in a brief. Here's a picture of this basic file structure on my computer. The file index.docx is an index of each document to be placed within each folder, for ease of reference. I have numbered each folder in order to have them structured in the order I want them. Like reverse date ordering, because name sorting is the default, folders that are numbered will be sorted by the number that precedes the folder's descriptive name. The more fields you add, the easier it is for counsel to understand what documents counsel is dealing with and what his or her instructor thinks about each document. This can be done in Microsoft Excel also, which makes it more convenient to convert the index into a database. I won't discuss databases in this post other than to say that they are a convenient way of keeping track of documents. The next step is to OCR [optical character recognition] all of the electronic PDF files so that they have recognised text and are therefore searchable. Scanned PDF files are usually saved as an image, rather than as text, and as such each PDF file needs to have its image converted into text for the text to be recognisable. Saved Microsoft Word documents will almost always be OCR'd. OCR'ing (that is, converting a PDF from image to text) is useful for, amongst other things, annotating the subject document, drafting affidavits, preparing submissions, and searching for relevant issues. For instance, where an electronic brief has, say, 2000 pages, if each page is in searchable PDF format then locating particular words or a particular phrase is easy. Also, by using a sophisticated search program such as Foxtrot Pro, specific strings and combinations of words can be searched for. Further, text may be readily copied and pasted from searchable PDF documents into affidavits and submissions. A program such as Adobe Acrobat will allow you to OCR PDF files. I am informed by my colleagues that there are free programs available which allow you to convert an imaged PDF into a text recognised PDF. However, I find that Adobe Acrobat is ideal as you can run batch OCR'ing on folders so as to convert multiple files at the one time, and then use the same program to manipulate the file with bookmarks and annotations (more on these below). 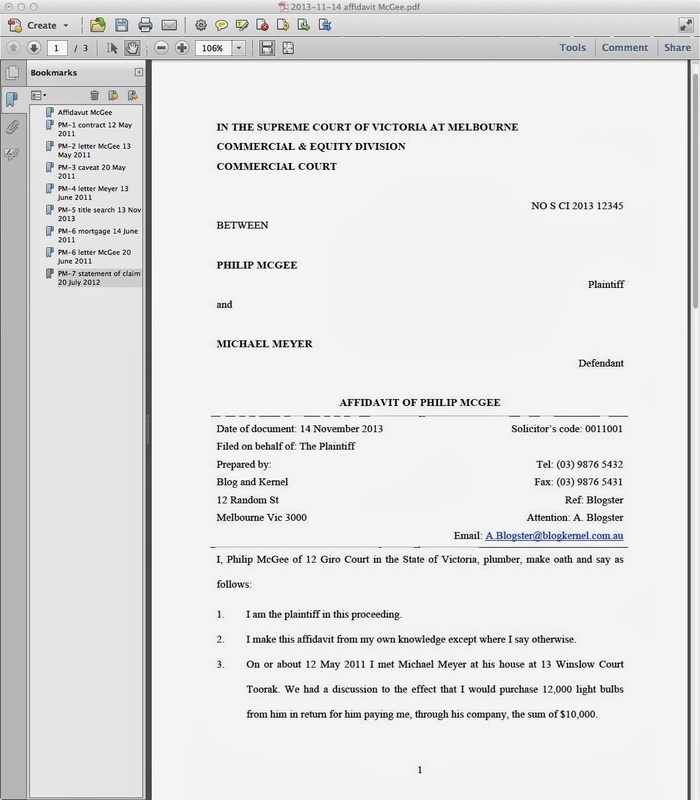 Page 1 of the affidavit - bookmark as 'affidavit McGee'. Exhibit PM-1, which is a contract dated 12 May 2011 - bookmark as 'PM-1 contract 12 May 2011'. Exhibit PM-2, which is a letter from McGee to Meyer dated 13 May 2011 - bookmark as 'PM-2 letter McGee 13 May 2011'. Exhibit PM-3, which is a caveat dated 20 May 2011 - bookmark as 'PM-3 caveat 20 May 2011'. Generally it's okay to be less fussy about the way that electronic bookmarks are named (unlike files) because they are ordered based on their placement in the document. It is more important to ensure that they are sufficiently described so as to understand what the bookmark refers to. Here's an example of a bookmarked document, opened in Adobe Acrobat. The bookmarks are on the left hand side, and I created them using Adobe Acrobat. In Court I like to read and refer to the electronic version rather than the paper version of a document because I find it a lot easier to navigate the electronic bookmarks than physical tabs and post-it notes. At this stage the files are named, bookmarked and sorted into organised and named folders. Once the memorandum to counsel is drafted and in PDF format, the electronic brief is ready to be delivered! So how do you deliver it? The chances are that a folder containing 50+ files will exceed the maximum size allowed for delivery via email. If the brief is small enough, it is possible to send it via email; however there are disadvantages with sending via email which you do not have with a cloud service such as Dropbox. The main benefit of a cloud service over email is that the instructor's folder structure and counsel's folder structure, if shared by a cloud service, will be synchronised and contain consistent content on an ongoing basis (assuming both instructor and counsel are online, either via Wi-Fi, or a wireless network). Email only sends the folders and files in the state they were in at the date they were sent, so any updates to the folder and files by one party after the email delivering the brief is sent will not be synchronised and updated on the other party's computer. Updates via synchronisation are especially important where court documents are being produced at a rate of knots, or discovery/instructions are being drip-fed. Dropbox and cloud services are, in essence, private hard drives stored externally to your computer and accessible online. As such, if you subscribe to a cloud service you will have a folder on your computer which allows you to drag and drop content into that cloud service. To place the electronic brief into a cloud service, all you need to do is drag and drop the root folder into the cloud service, and this will create a copy of the brief externally to your computer in the cloud. Once this is done, most if not all cloud services allow you to 'share' the folders in the cloud by sending a link of that folder to whomever you want to share it with. Otherwise (subject to the specific terms of service of the cloud service you subscribe to) the content in the cloud is only accessible by you via a password. Those that you share the folder with may include counsel, the client and other solicitors in the firm, as long as they all subscribe to the same cloud service. Once the link is sent by email, counsel opens it up and the brief is with counsel in counsel's cloud service and on counsel's computer for counsel to read, amend and add to as he or she wishes. If there is a particularly sensitive document in the brief, then this doesn't have to be placed in the cloud, but instead could be sent via email. That is, there will be a solution to the issue of confidentiality and it ought not stand in the way of briefing and sharing documents electronically. In saying this I do speak from the point of view of a commercial practitioner. Most if not all of the documents I have in a particular matter, other than documents that are subject to legal professional privilege, would be common between the parties. In any event, privileged documents can be separated into a specific subfolder in the electronic brief, or sent via email instead. A great outcome of this process is that counsel and the instructor have the electronic brief available for use on an iPad by using GoodReader, alternatively Documents by Readdle. I use Goodreader because I am used to it, and it has great functionality. I previously posted a review on Goodreader - click here to read it. Goodreader, like Adobe Acrobat on a computer, allows the user to go through folders, read documents (particularly PDF documents), and annotate those documents as counsel pleases. The annotation functionality is similar to hardcopy annotation - you can put notes on each page, highlight sections, and bookmark each page. The original PDF document doesn't have to be adulterated since Goodreader asks the user whether the user wishes to create a copy document for annotation. 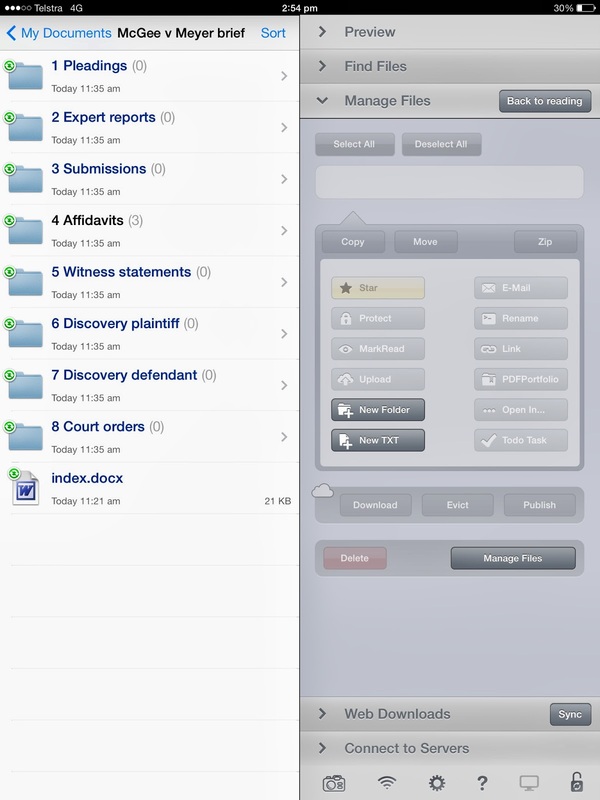 Once the folder is on the cloud, counsel can connect to the cloud service and 'synchronise' the folder in Goodreader. 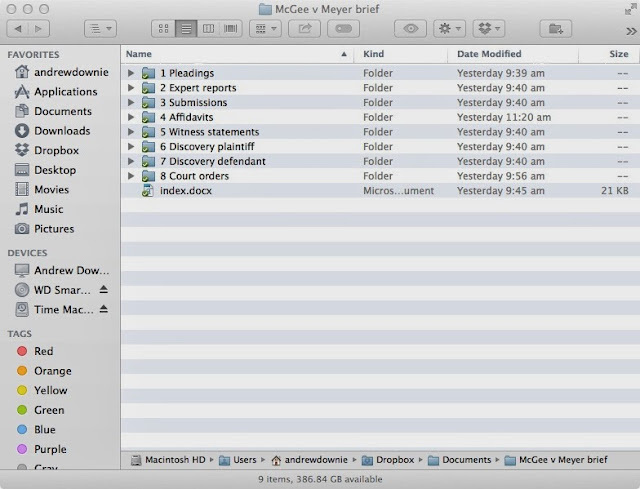 What that means is that the brief is downloaded to counsel's iPad and, whenever a document is updated and synchronised by counsel or by the instructor on their computers or on their iPads, the brief is updated on all users' iPads and computers. Goodreader doesn't automatically synchronise - one has to select to synchronise for this to occur. This is convenient to avoid corrupted files and synchronisation errors where, for instance, one user is reading a file while another user is editing or updating it. Here's an image of the above electronic brief synchronised to Goodreader on my iPad. So that's about it. This is how I prefer my briefs to be and it is a process I often undertake to convert my hardcopy briefs into electronic briefs. That doesn't mean I don't like hardcopy. I just prefer the convenience of electronic briefs, particularly when I sit at the bar table in front of a Judge and look at what comprises my brief. At that point I'm either staring at an iPad with a perfectly organised folder of annotated and sorted documents which I can move through with ease, or I'm staring at a huge pile of 5 or so lever arch folders which have post it notes in them and highlights throughout. The Centro matter: ASIC v Healey  FCA 717 and breach of director's duties.